Home Enlivening A Missing Element? Without earth, we would be subject to the elements and without the ability to nourish our vessel we would surely perish. Earth grounds us in our abilities to provide for our self, in the most tangible and necessary ways. Earth is stable, reliable, practical, nurturing and hardworking. Air is the breath of life. We humans need air to provide our lungs with oxygen, so our heart beats in its natural rhythm. Without air, we would lose the beat that keeps us alive. Air is fleeting, unpredictable and can be quite drastic, it is mysterious and expressive and in constant motion. Air allows us to be carefree, independent, flexible and charming. Fire provides us with warmth and illumination. It is a necessary tool in which to cook our food in the light of our kitchen, but fire cannot exist on its own. Fire is dramatic and entertaining, it’s power draws you to its transformational essence and lures you to it’s bright and charismatic flames. Water is the life-giving fluid that keeps our physical body moist, without water we would shrivel and die. Water is constantly flowing, with much of its activity happening below the surface of the planet. We must connect deeply to the depths of the earth to find what is transparent and tasteless. Water is calming and meditative on the surface but below the exterior it can be in constant turmoil, raging with a passion to find it’s a way to the ocean. Water is flexible, compassionate but a force to be reckoned with. Water at times can be unstable with its ebb and flow. Water makes a definite path, every movement becomes a part of that path, even when it sometimes can be an unexpected one. We are these life force elements, each of us must have some characteristic of earth, air, fire, and water in order to stand in balance in our life. Which element do you lack, which element are you hoarding too much of? 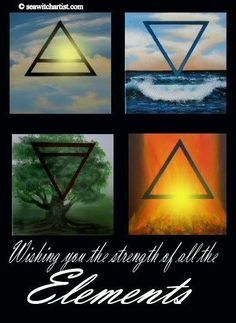 Earth is stability, Air changes, Fire ignites, Water is passion, give some thought as to what you should allow your self to embrace more of or less than, so you may feel more stable and secure within your Soul.